Dwayne Johnson is surrounded by so many ladies! The Jumanji: Welcome to the Jungle actor was honored with the 2,624th star on the Hollywood Walk of Fame on Wednesday and brought along a couple of the wonderful women in his action-packed life. 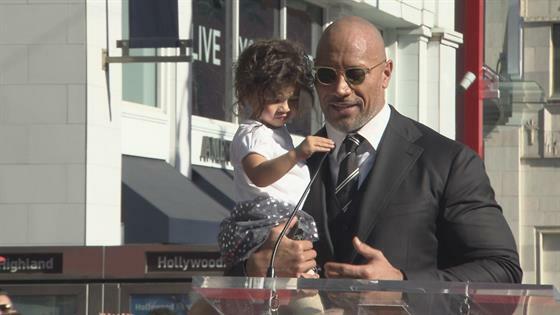 For the event, the 45-year-old was joined by his pregnant girlfriend Lauren Hashian and their almost-2-year-old daughter Jasmine. During the event, Johnson, who announced on Monday that he has his longtime love were expecting a second daughter, stopped by to chat with E! News about the momentous tribute, his recent baby news reveal and what it's like to be a famous father. When asked about what he knows now as a dad compared to when he was younger (Johnson also has a 16-year-old daughter Simone Johnson from a previous marriage), the movie man said he has learned that he can have it all. The Baywatch star said that he now understands, "It can all work together at the same time seamlessly in terms of your work and your career and your family. One doesn't have to be sacrificed for the other." The soon-to-be father-of-three added, "So many fall into that pitfall. I fell into the pitfall." His Jumanji co-star Jack Black also hit up the ceremony, as did Hollywood Chamber of Commerce's Chairman of the Board Jeff Zarrinnam, Councilmember Mitch O’Farrell and Leron Gubler, the president of the Hollywood Chamber of Commerce. The Chairman of Sony Entertainment’s Motion Pictures Group Tom Rothman also stopped by to support the star. It's been a big week for the big-time movie mogul. In addition to his star ceremony and the baby reveal, Johnson and his girlfriend of 10 years also hit up the red carpet premiere of his new family friendly flick on Monday night. The Central Intelligence actor also made sure to gush about his teenage daughter Simone, who was announced last month as the 2018 Golden Globe Ambassador. "We have such a high-quality relationship...she continues to teach me," said the doting dad during the event. "I am incredibly proud of her." As for any tips for his daughter's duties at the 2018 Globes, the star said he's told the teen: "I want you to be present and in the moment. That's important and enjoy it because things happen so quickly. We're on this treadmill of life where there is no stop button." He had some other wise words: "Just be present in the moment, have fun and also know you are carrying the torch for our industry that we are making our living in and you are also carrying the torch for our family." Jumanji: Welcome to the Jungle swings into theaters on Dec. 20.